Wearing a Shantanu and Nikhil gown, Lakshmi attended the Critics Choice Film Awards on Sunday evening. On the ramp, the gown was presented with a leather high-neck top, which she skipped on. I didn’t mind that she went without, she looked nice, but the top gave the gown more of an edgy feel and I would’ve liked to see it on it. Dia attended the Reel Movie Awards on Tuesday evening wearing a sari-inspired gown by Shantanu and Nikhil with a sleek middle parted do. She sure looked good but wish she had picked a more minimalist sandal. For Kiara, it was a strapless gunmetal gown by Shantanu and Nikhil. Now, the gown may not be everyone’s cup of tea but I quite liked it. Wearing it with the sleek wet do and the metallic finger rings made for good finishing touches. Here is another pic of her. Opting for desi wear were Jackky, Aparshakti and Jim at the Zee Cine Awards on Tuesday evening. I thought they all looked good, but loved Jim’s choice just a wee bit more. 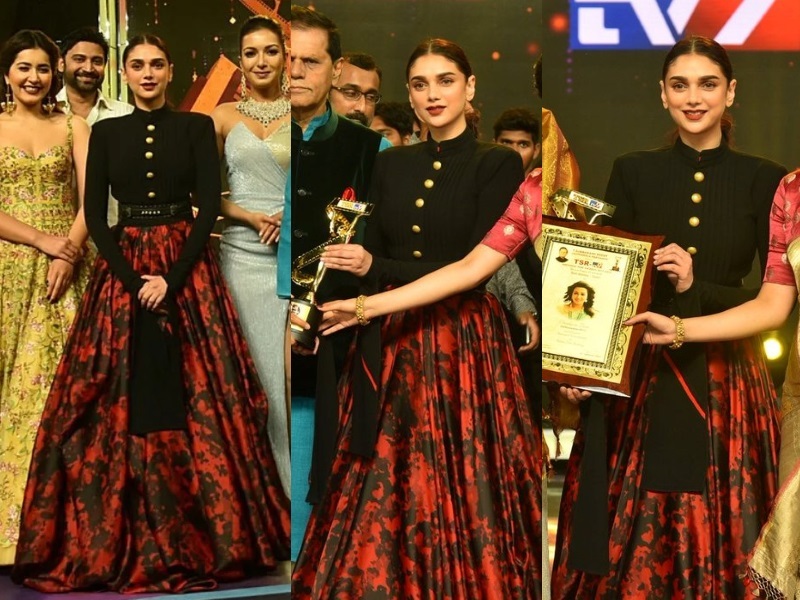 At the TSR TV9 Awards that took place in Vizag on Sunday evening, Aditi was seen in a fresh off the LFW runway Shantanu and Nikhil military inspired gown. With those big buttons and the voluminous skirt, opting for a no jewellery look worked. She looked good.